Sprout wants more out of life than being a coop hen and laying eggs for the farmer. 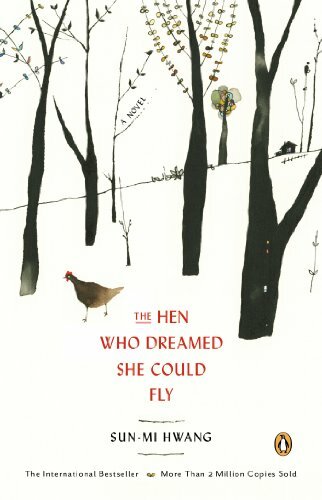 She dreams of being a barnyard hen and raising a family of chicks of her own. When Spout manages to escape from the chicken coop she finds the barnyard animals less than welcoming. The barnyard has a hierarchy of its own and laying hens are not a part of it. They tell her she has to leave. Sprout is a determined hen. She perseveres and survives with the help of Straggler, a wild mallard duck, who is also an outsider to the barnyard. When Sprout finds an abandoned egg in a brier patch, she adopts it and broods it, raising the chick as her own with a mother’s love. The story is a modern fable translated from Korean. It was a fast, easy read with simple, stark prose. I’m not sure if the simple prose is deliberate or if something was lost in the translation from the original version. It was filled with metaphors and rich in meaning, but had simple, straightforward phrasing. The story is appropriate for readers of all ages, however it might not be a good choice to read to very young children who might be sensitive to the reality of prey animals and life in the wild. Although this is a small book it has a lot of substance. When you dig beneath the fairy tale surface there are lessons on what makes a family, life and death, sacrifice, and ultimately that we should never lose sight of our dreams. Source: eGalley provided for review by Penguin Books. Sounds like a cute read. I like the cover. Me too. If a book has an enticing cover I’m more likely to pick it up or read the description. I love books like that. It sounds like this one was translated well. I thought the translation was fine but I’m still curious if it’s the same simple prose in Korean. I’d love to read this! I love that book cover. I often wonder what’s lost in the translation with books like that too. I never know if it’s spare prose on purpose or not!